Nice mix of education and eye-catching design, courtesy of this Animal Alphabet print by Kay Vincent. 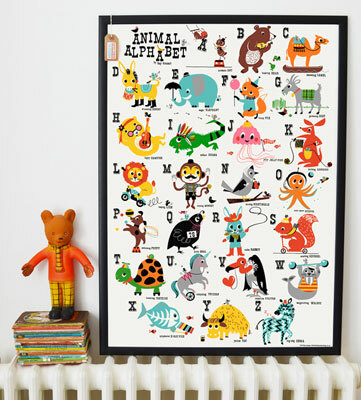 It’s a cutesy and you could say retro-style print, offering a great introduction to the alphabet and the world of animals for your little one, but above, offering some lovely colourful design for any small child’s room. It’s a litho print on 170gsm silk paper, sized A1 (33.1 x 23.4 inches), selling for £25.